Getting bitten by a spider could be very serious. But before you panic, remember that not all spiders are dangerous. These tiny creatures bite for self-defense. By nature, spiders do not attack creatures larger than themselves. But they may bite humans when they get pressed up or when spiders mistake human body parts (such as fingers) for small insects. If you have been bitten by a spider, remain calm and check the following to determine if you need emergency medical care. There are two spider species that are very poisonous and can cause harmful or even fatal reaction to the bitten person. These are the black widow spider and the brown recluse spider. Both spiders love warm surroundings. The black widow spider belongs to the Latrodectus family of spiders. These spiders are small, shiny, black, button-shaped with a red abdomen mark that resembles an hourglass. A black widow spider bite is very poisonous because the widow spider releases “latrotoxin” and causes a condition called lactrodectism. The female black widow is more venomous than the male because it contains bigger venom glands. Immediate medical attention is needed when bitten by a black widow spider. 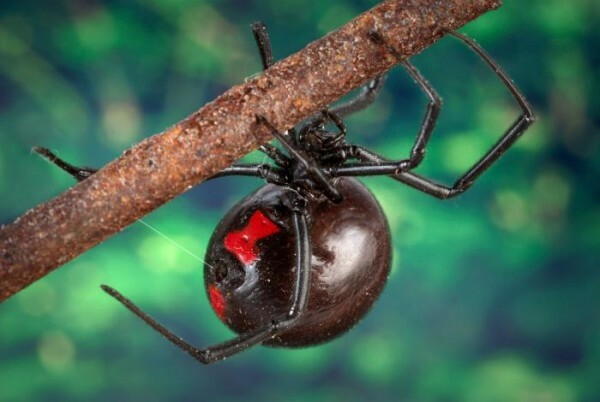 The symptoms for black widow bite depend on the body area, the amount of venom or toxin released and the body sensitivity to the bite. In many cases, the venom can be very painful when it affects the nervous system. Sometimes, the whole body is affected and may manifest systemic symptoms such as severe pain of the muscles and joints, as well as the back and abdomen, vomiting, dizziness, sweating, restlessness, hypertension, chilling and fever, swelling of the face, rashes and difficulty in breathing. Pain may be felt within the next 12 hours. After several days, the symptoms may go away but feeling of weakness may still persist. Read more about the black widow spider here. The brown recluse spider (BRS) is easily identifiable because of its violin-shaped mark on its back. Thus, the BRS is known by such nicknames as fiddleback spider, brown fiddler, or violin spider. It belongs to Loxosceles recluse family. Like the black widow, the brown recluse spider has a venomous bite. 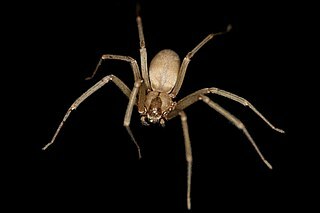 If a person is bitten by a brown recluse spider, he can feel a mild stinging sensation and red mark on the area of the bite and painful swelling within the next 8 hours. Slight fever, rashes, nausea and restlessness are the common symptoms. Bitten children may die when left untreated, although such cases are rare. Read more about the brown recluse spider here. Identify what type of spider bit the person. Wash the bite area with soap and water to cleanse it. Cold compress should be applied over the affected area. If bite area is on an extremity, try to elevate it. Take acetaminophen like aspirin and antihistamines to relieve minor signs in adults but take precaution when giving aspirin to children or teenagers. Monitor the bite for any changes or if symptoms worsen within 24 hours. Seek medical help when symptoms of allergic reaction manifest. After identifying the spider that bit a person, give the appropriate spider bite treatment. Call 911 or your local emergency service if a person has been bitten by a venomous spider and the victim is experiencing allergic reactions, such as difficulty of breathing, nausea and feeling of weakness. Clean the wound or bite area thoroughly. Apply cold compress or ice pack to the affected area. Take acetaminophen and antihistamines to relieve minor symptoms. Elevate the arm or leg to slow down the spread of the spider venom. Also, avoid moving the victim to slow down the venom. Tie a snug above the spider bite, but take caution not to cut off the blood circulation. Take the person to the doctor for further medical treatment if symptoms persist within 36 hours. Antivenom and hospitalization may be required. Aside from the regular treatment routing-elevation and immobilization of the effected extremity, application of cold pack, local bite or wound cleansing and tetanus prophylaxis, other spider bite treatment can be applied. These include hyperbaric oxygen, dapsone, antibiotics, dextran, glucocorticoids, vasodilators, heparin, nitroglycerin, electric shock, curettage and surgical excision. Although rare, severe complications like coma, kidney failure and death can result from a spider bite. Still infants and young children, adults who are 60 years and more, and those with heart condition are at high risk and must be cautious. So the best thing to do is to stay away from areas where you can get bitten by spiders (such as tall grasses and wood piles). Wear protective clothing when handling stacked piles of materials. Inspect your clothing, shoes or anything before using them. Store your clothes and equipment in closed plastic bags. Crap nonsense! 25,000 volts will neutralize ANY poisonous bite. Do the research on the Internet and then ask this doctor why he won’t tell people the truth. It works!! I ve been telling people since about 1994. There is device like it campers world catalog. BludBaut, are you speaking from personal experience that “25,000 volts will neutralize ANY poisonous bite”? Or are you just running your mouth? What is it about “Do the research on the Internet” that you don’t understand? What difference would my words make? By *RECOMMENDING doing the research yourself*, you can find far more than just one opinion, along with pictures, doctors’ remarks, etc. That is, if you’re intelligent enough to know how to use a search engine. If you’re not, then ask me again and I’ll give you more information. *Bear in mind*, the medical industry put the word out to spread disinformation on this years ago because this will take millions of dollars from them and therefore FDA made it against the law to advertise stun guns for poisonous bites–they don’t take kindly to being deprived of all that money even though they have *NO* remedy for brown recluse bites! COLD-BLOODED is what they are! This is a very revealing example that the medical industry cares nothing about your health. Electro-shock therapy has been used in third world countries for many years and missionary organizations have given stun guns to their people. Consider how impossible it can be many times to get to a hospital in time to save someone’s life yet the medical industry DECEIVES the public on this all for the sake of THEIR GREED! YOU ARE RIGHT – MY SON HAD A NASTY BITE. HE WAS TREATED WITH A STUN GUN AND IT CLEARED RIGHT UP. We live in a house well over 100 years old, and my wife has been bitten 8 times, myself 3. We treat them with a poultice of activated charcoal, and they usually go away in about a week. Sticky spider traps have cut way down on the bites, with the last one occurring 7 months ago. We live in a house that is well over 100 years old. My wife has been bitten 8 times, and myself 3 times. We treat them using a poultice of activated charcoal, and the swelling is usually all gone in less than a week. Glue traps have really cut down on the bites, with the last occurring about 7 months ago. Did try what I did? It also worked for gold searcher in Nevada. Take a plug wire of your car, start your car and then just for a moment shock yourself where you got bitten. You might need a metal coat hanger for. I ve done it for brown recluse. Got this from an old country southern doctor. It’s been widely used in third world countries for many years. People need to verbally assault the AMA over this transparent greed at the cost of lives. I won’t bother to tell you of the many other ways the medical industry chooses greed over helping people but if you know how to search the Internet (and Google has effectively hidden the results from you), you’ll be appalled at how peoples’ health *always* takes a back seat to profits for the medical/pharmaceutical industry. They pay off your elected representatives to keep them from doing anything about it. Hi… Ive read your story from start to finish. I do know facts that prove you are correct with what youve shared- indicating the unjustifiable greed & laws-set by those that also carry them out such as the 7pharmaceutical industry, doctors, insurance companies, their lawyers, judges, .. & the list goes on (as long as sh_t rolls down hill). In these past 2 years, especially, Ive been self taught-to take responsibility for your own health. Even at the mercy of the Dr.’s who genuinely do care about their patiients. They refused to allow this post before because this site is a shill for the medical industry. It was put here to keep you from looking for remedies THAT WORK! I will come back to check if they delete it again. This site needs to be exposed for what it is–a disinformation site.